Deployed Lageos 2, CTA. External tank lost a 10 x 20 cm corner of the left bipod ramp; orbiter took a higher-than-average 290 hits on upper and lower tiles. AKA: Columbia. Launched: 1992-10-22. Returned: 1992-11-01. Number crew: 6 . Duration: 9.87 days. Orbits of Earth: 159. Distance traveled: 6,645,026 km. Orbiter Liftoff Mass: 113,457 kg. Orbiter Mass at Landing: 97,572 kg. Payload to Orbit: 9,106 kg. Payload Returned: 6,540 kg. Landed at: Runway 33 at Kennedy Space Center, Florida. Landing Speed: 391 kph. Touchdown miss distance: 329 m. Landing Rollout: 3,263 m.
Oct. 22, 1992, 1:09:39:6433 p.m. EDT. Launch delayed l hour and 53 minutes due to RTLS crosswind constraints at KSC's Shuttle Landing Facility and cloud conditions at the Banjul TAL site. Payload weight up: 20,077 lbs. Total Vehicle weight 4,514,325 lbs. Vehicle empty weight: 181,169 lbs. Orbiter weight at liftoff 250,130 lbs. Duration: 9 days, 20 hours, 56 minutes and 13 seconds. Nov. 1, 1992, 9:05:53 a.m. EST, Runway 33, Kennedy Space Center, Fla. Rollout distance: l0,708 ft. Landing Weight: 215,114 lbs. Payload down weight 14,419 lbs. Primary mission objectives were deployment of the Laser Geodynamic Satellite II (LAGEOS-II) and operation of the U.S. Microgravity Payload-1 (USMP-1). LAGEOS-II, a joint effort between NASA and the Italian Space Agency (ASI), was deployed on day 2 and boosted into an initial elliptical orbit by ASI's Italian Research Interim Stage (IRIS). The spacecraft's apogee kick motor later circularized LAGEOS orbit at its operational altitude of 3,666 miles. The USMP-1, activated on day one, included three experiments mounted on two connected Mission Peculiar Equipment Support Structures (MPESS) mounted in the orbiter's cargo bay. USMP-1 experiments were: Lambda Point Experiment; Materiel Pour L'Etude Des Phenomenes Interessant La Solidification Sur Et En Orbite (MEPHISTO), sponsored by the French agency Centre National d'Etudes Spatiales; and Space Acceleration Measurement System (SAMS). Secondary payloads: (1) Canadian experiment, CANEX-2, located in both the orbiter's cargo bay and middeck and which consisted of Space Vision System (SVS); Materials Exposure in Low-Earth Orbit (MELEO); Queen's University Experiment in Liquid-Metal Diffusion (QUELD); Phase Partitioning in Liquids (PARLIQ); Sun Photospectrometre Earth Atmosphere Measurement-2 (SPEAM-2); Orbiter Glow-2 (OGLOW-2); and Space Adaptation Tests and Observations (SATO). A small, specially marked satellite, the Canadian Target Assembly, was deployed on day nine, to support SVS experiments. (2) ASP, featuring three independent sensors mounted on a Hitchhiker plate in the cargo bay -, Modular Star Sensor, Yaw Earth Sensor and Low Altitude Conical Earth Sensor, all provided by the European Space Agency. Family: Manned spaceflight. People: Baker, Mike, Jernigan, MacLean, Shepherd, Veach, Wetherbee. Country: USA. Spacecraft: Columbia. Projects: STS. Launch Sites: Cape Canaveral. Agency: NASA, NASA Houston. 1992 October 23 - . STS-52 - Wakeup Song: Wake Up Columbia - . 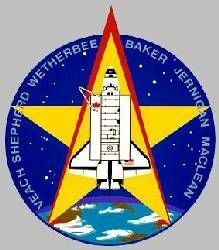 Flight: STS-52. "Wake Up Columbia" an original composition by Crow Carroll. 1992 October 24 - . STS-52 - Wakeup Song: Shake, Rattle, and Roll - . Flight: STS-52. "Shake, Rattle, and Roll" by Big Joe Turner, in honor of deployment of Laser Geodynamics Satellite-II which will help measure the shake, rattle, and roll of the Earth's crust. STS-52 - Wakeup Song: The World is Waiting for the Sunrise - . Flight: STS-52. "The World is Waiting for the Sunrise" written by Gene Lockhart and performed by Les Paul and Mary Ford. CAPCOM: Don Thomas. 1992 October 28 - . STS-52 - Wakeup Song: Hawaiian music - . Flight: STS-52. "Hawaiian music" set the tone for the day's planned discussion. 1992 October 29 - . STS-52 - Wakeup Song: Mack the Knife - . Flight: STS-52. "Mack the Knife" Bobby Darin. 1992 October 30 - . STS-52 - Wakeup Song: Bang the Drum - . Flight: STS-52. "Bang the Drum" Todd Rundgren, in honor of Max-Q drummer and Mission Commander Jim Wetherbee..
1992 October 31 - . STS-52 - Wakeup Song: Monster Mash - . Flight: STS-52. "Monster Mash" Bobby"Boris" Pickett. STS-52 - Wakeup Song: Notre Dame Victory March - . Flight: STS-52. "Notre Dame Victory March" sung by JSC employees and Notre Dame grads, Chris McKenna, Mark Ferring, Pete Hasbrook, and Fisher Reynolds. Notre Dame is also the alma mater of Wetherbee..